2. Cook meat in a nonstick skillet over medium-high heat until browned, stirring until it crumbles. Drain, if necessary, and return to skillet. Add tomatoes, and cook until heated through. 3. While meat cooks, coat a 13 x 9 inch baking dish with cooking spray. Unroll pizza crust dough, and press into bottom and halfway up sides of the baking dish. 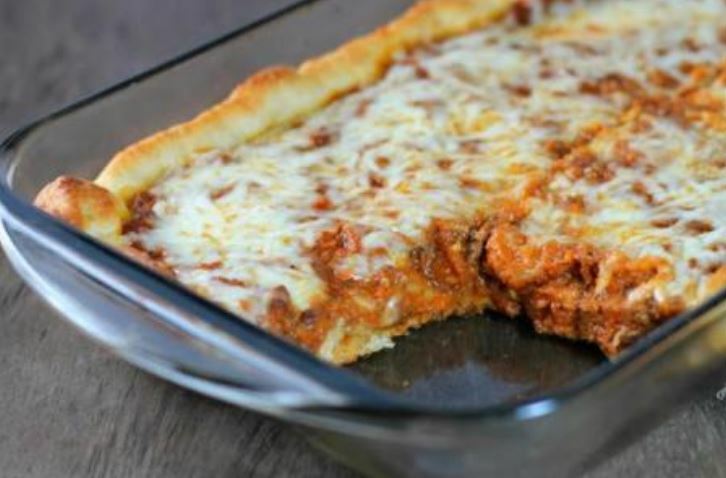 Top the pizza crust with meat mixture. 4. Bake, uncovered, at 425° for 12 minutes. Top with cheese, and bake 5 minutes or until crust is browned and cheese melts. Cool 5 minutes before serving.